"Brody Bedlam, immortal source of chaos, has taken over the crime network of the oldest city in the nation, holding the mayor in his pocket and the citizens in fear. Rayph and his Manhunters move to usurp him, but the street war brings casualties Rayph cannot justify. With his crew unraveling and pressure mounting from the unsatisfied king, will this mission be Rayph’s end?" It's a busy time of year and I have a lot of books for review lined up, so this week gets an extra review! 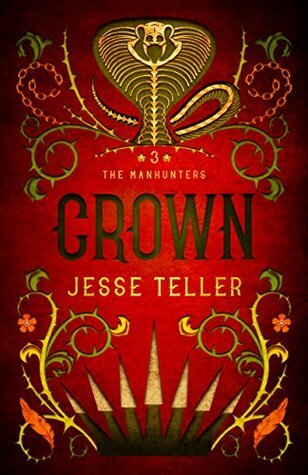 Crown is the third and final book in Jesse Teller's Manhunters series, and I must say it is goes out with a bang. I've previously read, enjoyed, and reviewed the first two books in this series, Song and Hemlock, and was thankful to have the opportunity to finish off the series and see how everything gets wrapped up. We once again get to journey on with Rayph Ivoryfist in this latest installment, along with many of the existing characters that we've grown to love as well. I've had such a great time following the Manhunters group and I once again found myself immersed in this group and eager to follow their actions. In addition to the existing characters, a few new characters are introduced and I thought that they were incorporated smoothly into the story, adding even more personality to the existing cast of characters. What I particularly appreciate about Teller's writing is how much care he seems to put into his characters, both the good and the bad one, fleshing all of them out in a detailed manner. The development of these characters has definitely grown stronger with each book, and the villains were expertly created and made me interested in finding out more about them. This series has been dark the entire time, but Crown explored new types of darkness, including the loss of some people close to Rayph. Teller depicted this particular topic with a deft hand and the way it was handled by Rayph and others felt very realistic. There is also just as much blood and violence as in the previous books, so it's safe to that Crown did not lose any of the intensity of the first two books, but instead continued on with the dark intensity established in prior books in this series. The last book in a series always has a lot of pressure attached to it because of everything it has to accomplish: wrapping up plot lines, taking care of characters, etc. In the end, I felt very satisfied after finishing this book. All of the major plot lines and issues were wrapped up in a really well-written manner that didn't feel rushed or thrown together at all. I wish certain areas and topics would have had a little more time to be explored, but on the whole I've enjoyed following the Manhunters throughout this crazy ride, and I do hope to see more from this world one day. Overall, I've given Crown four stars!